Patrick Cook has ‘eyes and teeth’ galore as sizzling songster Jack Robin who discovers ‘you’ve got to sing what’s inside of you.’ The Jazz Singer plays the Toronto Centre for the Arts until June 18, 2017. Hats off to The Harold Green Jewish Theatre for closing off a milestone 10th season in blissful style. Director Tim French brilliantly transforms small venue limitations into large production ambition in validating the timeless adage what doesn’t kill you only makes you stronger. “I’ve been fighting for this night my whole life,’ asserts Jack in state of vexation. While he’s not the only seeker of the stars to utter these nine words as a dream begins to slip away, just hearing them rallies both high brows and low brows who find it impossible to escape the crazy rhythm of a genre. Michael Ross Albert’s elusive adaption of the celebrated classic is a shining example of what it means to shake up a musical theatre scene with a message of pain, forgiveness, and second chances that audiences can’t get enough of. Jack Robin (Patrick Cook) is the son of a Cantor who bids farewell to family for 8 long years in his pursuit to sing in a Broadway revue. With a teardrop in his voice, he’s a sensation in waiting. Fatherly friction results in his desire to sing for himself rather than pleasing God which proved to be a ‘knife in the heart.’ Can he mend a broken family fence and still achieve his objective? If only a day of atonement could ever be that hat easy! Passion versus duty is what makes The Jazz Singer crackle and pop with the warmth of an open fire. Performances so earnest and genuine make this the sleeper hit of June. 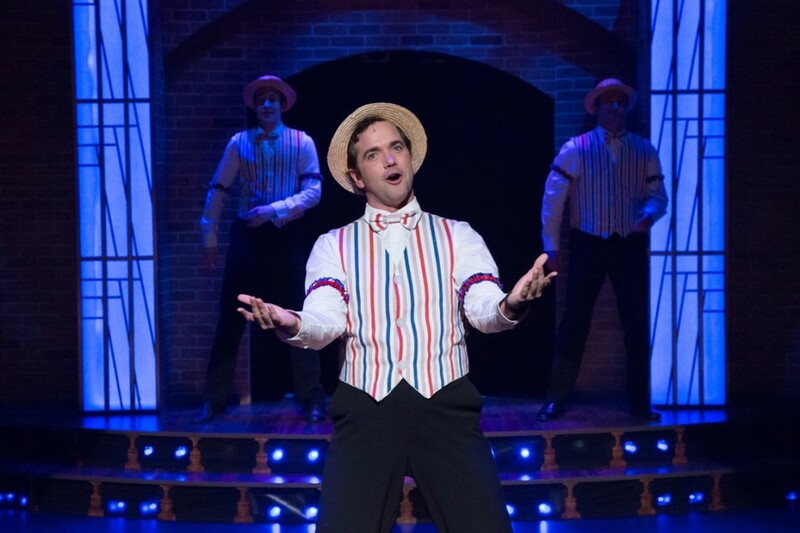 THE JAZZ SINGER musical adaptation by Samson Raphaelson May 23 – June 18, 2017 TORONTO CENTRE FOR THE ARTS, 5040 Yonge Street, Toronto TICKETS $45-$80 www.hgjewishtheatre.com 1-855-985-2787 CAST Patrick Cook, Kaylee Harwood, Theresa Tova, Victor Young, Aaron Ferguson, Joe Matheson, and Jivaro Smith DIRECTOR AND CHOREOPGRAPHER Tim French SET by Robin Fisher LIGHTING Siobhan Sleath COSTUMES Alex Amini MUSICAL DIRECTOR Mark Camilleri.